"Dynamite" --Publishers Weekly Ike Singer is a demolitions expert, or "master blaster." He is second to none at his craft, knows every type of explosive known to man, and is the one everyone turns to when they need a safe, controlled explosion. Despite being at the very top of his profession, a personal mistake that led to catastrophe nearly brought Ike's life to ruin. He has spent every day since atoning for that sin and trying to piece his family back together. And after a great deal of work and soul-searching, Ike believes he has finally moved on. Until now. Just when he believes he has found peace, Ike is targeted by a brilliant psychopath bent on systematically destroying his life. But Ike isn't some random target: this grudge runs deeper than a landmine's crater. Ike must use every resource in his arsenal to prevent this killer's vengeance, and be willing to sacrifice everything to save his family and his life before the timer hits zero. 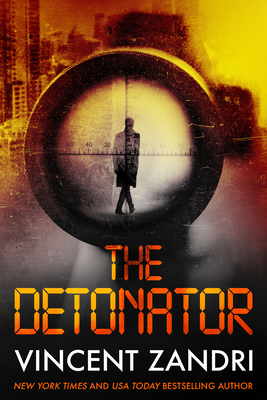 Because just when you think the past is behind you, you realize the fuse has been lit this whole time... Vincent Zandri is one of the most acclaimed thriller writers working today, and in The Detonator he offers his most suspenseful, shocking, and explosive novel yet. Vincent Zandri is the bestselling author of more than 20 novels including The Remains, Moonlight Weeps, Everything Burns, and Orchard Grove. He is also the author of numerous Amazon bestselling digital shorts, Pathological, True Stories and Moonlight Mafia among them. Harlan Coben has described The Innocent (formerly As Catch Can) as ..".gritty, fast-paced, lyrical and haunting," while the New York Post called it "Sensational...Masterful...Brilliant!" Zandri's list of domestic publishers include Delacorte, Dell, Down & Out Books, Thomas & Mercer and Polis Books, while his foreign publisher is Meme Publishers of Milan and Paris. An MFA in Writing graduate of Vermont College, Zandri's work is translated in the Dutch, Russian, French, Italian, and Japanese. Recently, Zandri was the subject of a major feature by The New York Times. He has also made appearances on Bloomberg TV and FOX news. In December 2014, Suspense Magazine named Zandri's, The Shroud Key, as one of the Best Books of 2014. A freelance photo-journalist and the author of the popular "lit blog," The Vincent Zandri Vox, Zandri has written for Living Ready Magazine, RT, New York Newsday, Hudson Valley Magazine, The Times Union (Albany), Game & Fish Magazine, and many more. He lives in New York and Florence, Italy. Find him online at VincentZandri.com or on Twitter at @VincentZandri.